Having been officially unveiled at MWC 2012 back in February, Samsung looks set to finally take its Galaxy Note 10.1 market as the Note follow-on features in a new US ad. Whilst Samsung has yet to offer any confirmed details surrounding the long overdue Galaxy Note 10.1 UK release date, an official Samsung teaser video has highlighted a number of the devices more intricate features including shape match functionality to bolster the stylus-based input controls and the tablet's multitasking capabilities. Despite being unveiled back in February, Samsung revealed just three months ago that the work-themed tablet's final specification was still undecided with further changes to be made to the device ahead of its eventual release date. Designed as a follow-on to the surprisingly popular 5.3-inch Samsung Galaxy Note smartphone, the Note 10.1, based on its MWC unveiled specs sheet, is expected to touchdown later this year with a 10.1-inch 1280 x 800p HD PLS TFT display paired with the company's S-Pen stylus. Lining up at just 8.9mm thick, the Note 10.1 will feature a 1.4GHz dual-core processor with a 7,000mAh Li-ion battery helping run the show whilst a 3-megapixel rear-mounted camera is paired with a second, 2-meg snapper on the front. Google's Android 4.0 Ice Cream Sandwich operating system is set to keep things running along smoothly. 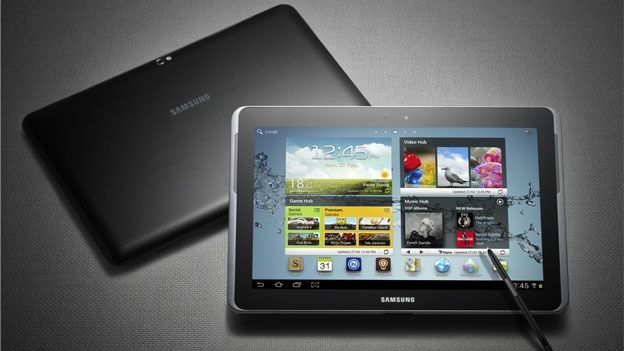 Are you still holding out for the Samsung Galaxy Note 10.1 or has the business-themed tablet missed its window? Let us know what you think via the T3 Twitter and Facebook feeds.